And for the ladies if you want that Decorative Rustic Lodge Look, we have just what you need. From Rivers Edge Deer Antler items, to night lights, candles, figurines and much more. 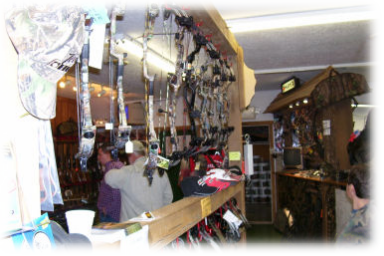 We carry top name-brand bows and hunting accessories, featuring Hoyt, Martin, Parker, and a large variety of arrows including Gold Tips, broadheads and components for target and bowhunting set-ups, camo, tree stands, blinds, targets, scent block and much, much more. If you are just getting started, we can completely outfit you for your hunt. Even the most seasoned hunter's heart races in moments like these. It's too important to be less than prepared. AT THE OLD TRADING POST, WE HAVE EVERYTHING TO GET YOU READY. We are your one-stop source for all your archery supplies, bowhunting equipment, hunting supplies and accessories, gifts, and more.